Recall that the Sales Pipeline tracks all qualified opportunities, i.e., those that are actively being pursued and where the seller has been able to achieve at least the first level of qualification, a Candidate, because the seller made enough progress with the prospect to get the prospect to admit their Critical Business Issue. Shown to the right are the key Adventace opportunity stages for qualified opportunities mapped to a representative Sales Pipeline. Each Pipeline Stage provides the total number of active qualified opportunities in that stage. The C and the B Stages do not provide a dollar or other currency value because they cannot be determined with a sufficient degree of accuracy. At the C stage, the initial sales call has not even been completed. At the B stage, the seller has not yet gained access to the Power Promoter, nor is there yet an action plan and, therefore, the value here also cannot be determined with a sufficient degree of accuracy. The A Stage is a total of the A and A+ stages. We differentiate between the A and A+ stages only for forecasting purposes, not pipeline balance, because the A+ stage is simply a set of A prospects with a higher qualification level because the seller has successfully completed certain key steps in an Action Plan. Opportunities in the NL (Near Loss) stage should be minimized. NL’s represent a failure to properly and early on in a sell cycle to disqualify an opportunity. They typically occur when various disqualifiers are ignored by the seller, but also a failure on the part of management to exercise “tough love” and remove the “opportunity” from the pipeline. They also occur when sellers respond to RFP’s they have no business responding to. This also represents a failure on the part of management to again exercise tough love. 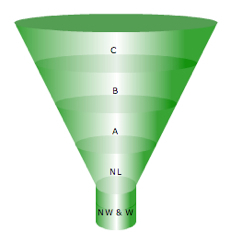 We combine the NW and W because NW is a stage that many opportunities skip (because they go directly to W) or if an opportunity does go to the NW stage, it is normally a short-term interim stage on its way to a W. Thus, it is not possible or relevant to determine a NW pipeline goal. It helps sellers maintain a continuously balanced pipeline, “24 x 7 x 365” days a year. It is designed to ensure continuous pipeline balance. In so doing, when a month, quarter, or year ends, and irrespective of whether or not the seller “made their numbers” for that period, it ensures that the seller enters each period with a fully loaded pipeline. The point above ensures that quotas are being met. Here’s how the PBA works. Looking at our Sales Pipeline, the concept is that coming out of the bottom of the funnel we want a consistent number of wins with sufficient value to achieve quota (as represented by $Win). The PBA works to ensure this via its two key components. The first component is the value (in dollars or other currency) of the A pipeline. Why the A pipeline? If you think about how we clearly defined an A prospect with a 50% probability of becoming a win, the A Pipeline becomes an excellent predictor of $Win. Therefore, managers calculate the financial value of each of their seller’s A pipeline. The second component is the number of New Opportunities to Create (NOC) each month to achieve and maintain the $A pipeline. A NOC is achieved each time an opportunity progresses from a S to either a C (by far the most common), B, or A opportunity each month. Then, consequently, if there is a gap in the $A pipeline managers are shown how many additional NOCs are needed for the upcoming month to alleviate the $A gap as quickly as possible. If managed closely, most can in fact be eliminated in one or potentially two months. Note, as shown below, that this entire process (determination of the PBA, gap identification, and NOC’s to eliminate the gap) is completely automated in our Adventace SMS application. And, by achieving his or her $A pipeline goal, sellers are able to consistently eliminate the roller coaster ride and achieve their quota.